The ancient Sauratown Mountains, one of North Carolina's eastern-most mountain ranges, are often called "the mountains away from the mountains" since they are separated from the Blue Ridge Mountains by quite a distance. However, these are mountains in their own right - prominent quartzite peaks rise from 1700 to 2500 ft in elevation, a good 1000 - 1500 ft above the surrounding countryside. 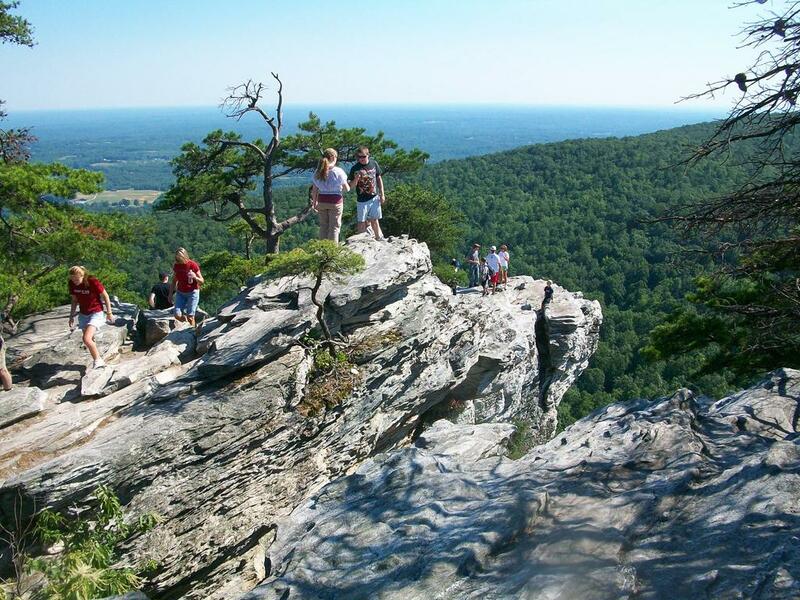 Located atop the Sauratown sits a series of rock outcroppings with interesting names, including Moore's Wall, Cook's Wall, Devil's Chimney, Wolf Rock, and, of course, Hanging Rock. Enjoying the summmit of Hanging Rock on a hot summer afternoon. 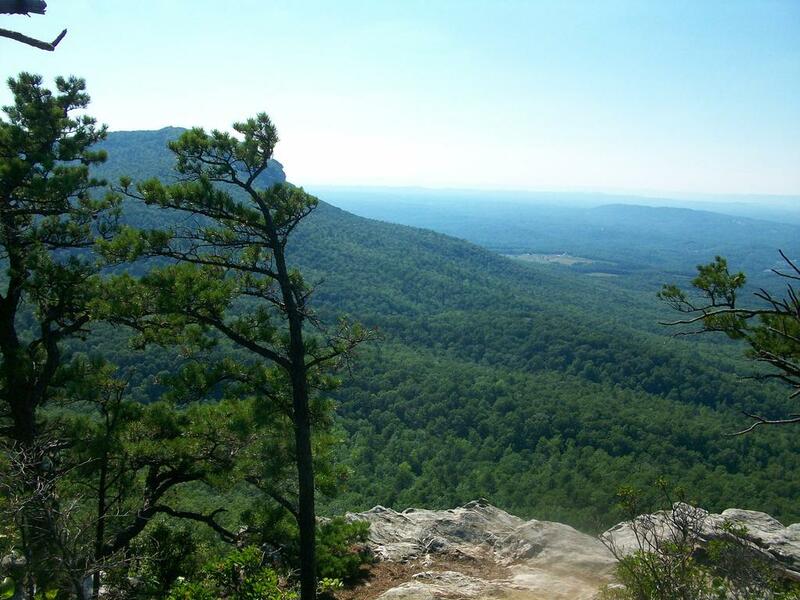 View from the summit of Hanging Rock on a hazy day. Located not far from Winston-Salem and Greensboro, the park makes an excellent choice for a day-trip from those cities, and it's even one of the closest Western NC mountain recreation areas to the Raleigh-Durham area further east (about 2 1/2 hours as opposed to about 3 1/2 hours to Blowing Rock or 4 hours or more to the trails around Asheville). Over 20 miles of trails are available in the park. In addition to those that lead to Hanging Rock itself, other trails in the park lead to other peaks and rock walls with spectacular views. 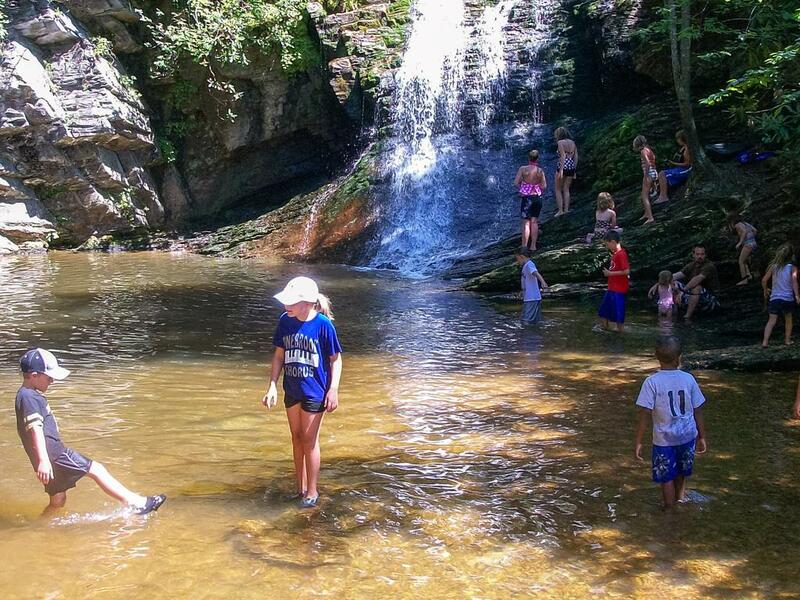 Several trails lead to North Carolina's easternmost significant waterfalls down in the valleys. Two picnic areas are available for lunch before the trail or grilling afterward; there are 60 tables total. One is at the main Hanging Rock trailhead and the other is near the lake. Speaking of the lake, a historic CCC dam, built in 1938, forms the 12 acre lake with boathouse and swimming area. Rowboats and canoes are for rent during the summer (private boats are not allowed). The Visitor Center includes an auditorium, exhibit room and a classroom for educational programs. There are restrooms, and the building houses a gift shop and the park office. The Family Campground inside the park offers two loops with a total of 73 sites for tents and trailers. Picnic table, grill, and tent pad are standard at each site. There are no hookups, but water is available, and bathhouses have hot showers and laundry (open from March 16 - November 30). Five Group campsites are also available near the park entrance, with picnic tables and a fire circle at each. Pit toilets and water are nearby. Finally, ten rustic family vacation cabins, accommodating up to six people each, are available as well. Each includes two bedrooms, a kitchen and living room. Weekly stays are required during the summer, and there is a two-night minimum during the spring and fall. Pets are not allowed in cabins or the cabin area. From Winston-Salem it's about an hour's drive - follow US Hwy. 52 North to exit 114 for NC Hwy. 8 (Germantown Road). Turn left and follow NC Hwy. 8 North for just over 17 miles to NC Hwy. 89. Turn left and follow 89 West for 5.2 miles to Hanging Rock Park Road. Turn left; the main park entrance and gate are about 1.6 miles up this road. 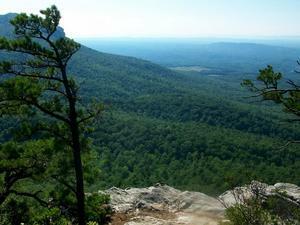 From Pilot Mountain, it's about a 30 minute drive - take NC Hwy. 268 East for just over 12 miles to NC Hwy. 80 East. Turn right and go just over 4 miles to Hanging Rock Park Road. Turn right; the main park entrance and gate are about 1.6 miles up this road.